Little Shelford Hall was the family seat of the Wale family who were the principal landowners of the village for 300 years. The first Shelford Hall, or the Old House, was built in 1640. It was altered in 1764 by Thomas Wale and then largely demolished in 1852. A new Gothic style house was erected (pictured left) around 90m north of the current Wale Recreation Ground. The hall burnt down in 1929. As the insurance covered only the value of the mortgage, rebuilding was not an option. The owner at the time of the fire was Fanny Lucretia Wale, the compiler of the book “A Record of Shelford Parva”. She had not lived in the Hall for a quarter century, having let it to a relative for much of that time. Mrs Eaden was living there at the time of the blaze - 24th February 1929 - when a fire, believed to have originated in the pantry, gutted the entire building. The roof caved in and there was little chance to retrieve any of the contents. The Lodge to Shelford Hall stands on the corner of Bridge Road and Whittlesford Road. This building was the north wing of the original 17th century Hall and it was retained to be used as an entrance lodge to the new house. There is a model of the original building in the possession of the Cambridge and County Folk Museum though it is not currently on display. Photos of the model can be seen here. 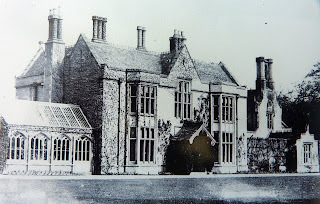 Click here to read about what life was like at Little Shelford Hall. Plans of the New Hall drawn from memory by John Altham, who lived there as a boy. This is a painting of the wedding of Adelaide Wale in 1881. The Wale family's house, known as Shelford House or Hall or the Old House, south-east of the church, was of 17th-century origin. It was altered in 1764 by Thomas Wale (fn. 82) and largely demolished c. 1852. The north wing, which has walls of 18th century brick but has been much altered, was left as an entrance lodge to a new house built in a Gothic style for R. G. Wale by W. J. Donthorn. (fn. 83) Much of that building was burnt down in 1928 (sic). The north wing and parts of the mid 19th-century stabling, converted into private houses, survived in 1980. Between 1775 and 1845 a family mausoleum, designed by William Wilkins, stood west of the house in Camping Close. (fn. 84) The house stood in a small park adjoining the Whittlesford road.